Sometimes, a good setting can make a good book great, or a not-so-good book just plain fun. I just finished Ghostman by Roger Hobbs, a thriller set in Atlantic City, New Jersey. Atlantic City is within a couple of hours driving distance from where I live, and trips to the Jersey shore have long been a part of my life. Escape weekends with girlfriends, road tripping in college, and family vacations are all part of my history with this location. Atlantic City’s dark side is in full view in Ghostman, a hard boiled, procedural tale of a robbery gone wrong. Hobbs flips the usual procedural tale here, and tells the story from the viewpoint of a bad guy, a “ghostman” – which is apparently, in heist terminology, is the guy whose role it is fix things, quietly, off the grid. This is a dark, bloody book. Hobbs creates a terrifically vivid sense of the underside of Atlantic City, complete with abandoned strip clubs, falling down houses, and cheap motels. Hobbs’ imagery is particularly good when it comes to odors – his protagonist uses his sense of smell to describe just about every location he visits. The strong odors of naphtha, blood, and damp permeate this book. Hobbs has a tendency to list things, which can get a bit dry. The protagonist, Jack – whose real name we never really discover – details the contents of his bag, car, and requests lists of items from his local AC procurer. Jack lists, rather than describes, his method of changing his appearance. There’s also a bit of the cyber punk style here with all the name dropping of gun types, ammunition, drugs, and designer clothing. The plot is quick paced, and very exciting. And as bad as our protagonist Jack is, there’s always someone more evil than he is. Hobbs alternates the present day plot in Atlantic City with a flashback of another heist gone wrong. This secondary plot is also quick paced and exciting. This book was released last year, and is Hobbs’ debut novel. There’s an interview with Hobbs that I found interesting, mainly for his description of his writerly life – ramen noodles and staking out a power outlet in the library for his laptop. For me, the main appeal of this fun novel was the setting. Somehow, reading about characters that are walking down the same streets you have walked down, and visiting the same places you’ve visited, creates a full sense of immediacy. And Hobbs’ descriptions of the approach to and the outskirts of Atlantic City capture the dichotomy of this place. The wealth and flash of the casinos and boardwalk contrast in a disturbing way with the tired looking neighborhoods just outside. I’m not sure how accurate Hobbs’ geography is, but I picture him at that library with maps and googling street views of Atlantic City. If you don’t mind violence and gore combined with drug use and cruelty, Ghostman is an entertaining book with a strong and compelling setting. 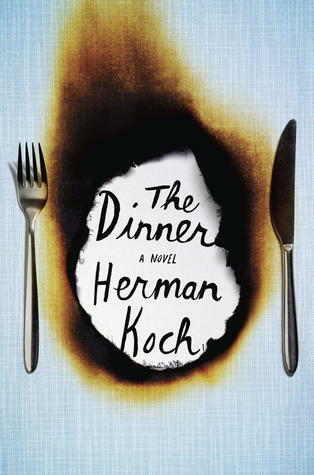 The Dinner by Herman Koch was the June selection for the AMBC (Awesome Members Book Club) and it was an amazing choice that sparked a terrific conversation. This novel was originally published in 2009 in the Netherlands, and the translation was released in February in the United States. Many reviews compare this novel to Gone Girl, and while it does have some similarities to the thriller by Gillian Flynn, Koch’s novel is much more subversive and satirical. The Dinner is the story of a dinner, two couples at a fancy restaurant meeting to talk about their teenaged sons. The husbands of the couples are brothers with a long history of mistrust and resentment, and their sons have committed an atrocity that needs addressing. Koch plots the book through the courses of the meal, from aperitif to appetizer, all the way through to after dinner espresso. The narrator, Paul, tells the story, piece by piece, revealing the disturbing and horrific details through flashbacks. Paul’s opening affability and talk of “happy families” deepens into something darker. The seeming ignorance of the wives is skewered. Serge’s popularity tries Paul’s impatience. Each flashback exposes another layer, and the reader understands that Paul is not the most reliable of narrators. The contrast between the painstaking descriptions of artistically prepared, artisan sourced food with the brutality and morally reprehensible actions of the characters takes the novel to a level of satire that I have not experienced in a very long time. Paul takes a perverse delight in asking the restaurant manager the provenance of the grapes garnishing his plate. The manager describes the grapes to a level of ridiculous detail but is unaware of Paul’s scorn. Similarly, Paul describes his own episodes of violence to the reader, evoking a response of horror and disgust from the reader that Paul would not understand. As I read the novel, my opinions of the characters evolved to such a degree that by the end, the “bad” characters were the only ones with any redeeming qualities. Koch satirizes many of the aspects of post modern life – the ridiculous obsession with food, the culture of celebrity, reality tv and YouTube sensations. And underneath it all lie the age old questions of nature vs. nurture and how far parents will go to protect their children. Moral bankruptcy is the final item on the bill at the end of The Dinner. This is a fast read that will draw the reader in quickly, almost too quickly – but I think that’s Koch’s intent. He draws you into a satirical black comedy, and then suddenly the reader realizes they are in the middle of a psychological thriller. This is a fantastic read, and I highly recommend it. If you enjoy a good story, it’s here. If you want deeper questions about morality and responsibility, they’re here too. Have fun!